It’s wedding season! If you’re lucky you will have received an invitation by now. Yes, I said lucky. How can attending a wedding not be enjoyable? Even the worst weddings are fun, perhaps not in the moment, but certainly in the tales you’ll tell later. That wedding that took place outside, with no awning, in the blazing sun, in August? You know, the one where they served cream of mushroom soup? It makes for a good story, no? How about the rural taxidermy spectacular at which you played “count the back tats” with your date? Good times. Without them would you have ever truly appreciated the Windows on the World pageantry, or the backyard exchange of vows under a weeping willow? Weddings are a good time not just because you might get to dance and mingle with people you know or like, but also because they are a peek into people’s character. An invited peek at that! Posh, homemade, sentimental, calculated, they are all “beautiful reflections of his/her love’s affection.” A wedding tells us scads about the couple’s heart’s desires. It used to be that weddings mostly told us about the desires of the bride’s mother. But times have changed. People remarry, marry later, marry within the same gender, marry outside of their faith, and marry with children. More and more, couples are redefining the steadfast guidelines of weddings. Weddings are archaic and traditions are always slow to change. There was a brief mini-bubble in the late 1960s/early 1970s when younger people married on mountaintops with an officiant sporting some beads and a ponytail. 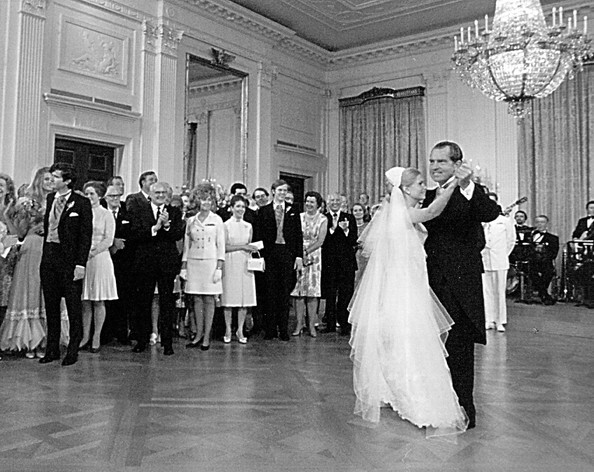 But by the mid-1970s the Tricia Nixon wedding was back in style. The shift in wedding style we are seeing today seems far more lasting. By virtue of who is marrying, weddings are becoming more personal in design. There will always be couples that prefer to follow a playbook (cue Wagner, Corinthians reading, candle lighting, receiving line, and we’re out.) We will give these couples the benefit of the doubt and not suggest they haven’t thought a whit about their wedding, marriage or each other, we will instead call them traditionalists. But they now seem to be in the minority. Older couples (in this context “older” means 30+) have hopefully formed many friendships and important relationships throughout their lives. Their wedding might reflect those in some way. When different faiths and backgrounds merge, the results can be a beautiful integration of customs. No one is forced to editorialize wedding traditions more than a couple of the same gender. Who walks down the aisle? Who sits where? Who dances with whom? The beauty of this process is that it often results in a “why in the world would we do THAT?” conversation. A conversation that every couple should be having about every assumption at every juncture. This all bodes quite well for the future. More thoughtfulness is always a good thing. Going through life attuned and conscious has a wonderful effect on the world. As I sip my champagne, careful not to spill on my silk, I will toast to this ritual that by its definition is steeped in hope. I will feel grateful for the opportunity to learn more about what makes the couple happy and how they feel about each other. And I will dance, if not to actual music, than in my mind. I will celebrate presence, consciousness, and of course, love. Thank you and do come back to visit soon!